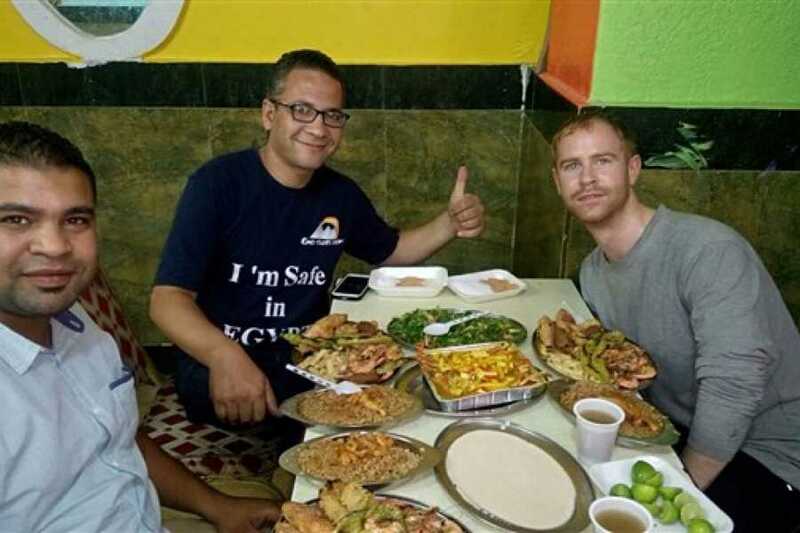 Food Tour available upon request, Private tour includes Entry Fees, Expert Tour guide, Our Prices Includes All Taxes Services, Snacks (Bottle of Water, Can of Pepsi, Chips & Cake), All Pickup & drop off transfers from Customer Location in either Cairo or Giza and All Transfers by Private Air Conditioned Vehicle Last Model, Tour excludes Personal Items and Tipping. A leafy, green, summer vegetable, molokhiyya is distinctively Egyptian, and locals will proudly serve you their traditional thick soup made from it. The chopped leaves are generally stewed in chicken stock, and served with or without pieces of chicken, rabbit, or lamb. This soup can also be served with crushed bread or over rice. If you're served it straight, it's polite to dunk your aysh. These small dishes of various forms are usually served with drinks. Those resembling dips are made with tihina, an oil paste of sesame seeds. Tihina mixed with oil and seasoned with garlic or chili and lemon can be served alone, but when combined with mashed eggplant and served as a dip or sauce for salads, its called baba-ghanoug. In Alexandria, chickpeas are added to the tihina to make hummus bi tihina. Tihina also forms the base for many general-purpose sauces served with fish and meats and replaces mayonnaise on Egyptian sandwiches. Turshi includes a variety of vegetables soaked in spicy brine--it's always good with beer. In addition to molokhiyya, the Egyptians make a variety of meat (lahhma), vegetable (khudaar), and fish (samak) soups known collectively as shurbah, and all are delicious. Salads (salata) can be made of greens, tomatoes, potatoes, or eggs, as well as with beans and yogurt. Western-type salad bars have come into vogue in larger cities, and here, for a few pounds, you can make a whole meal of the fresh produce. Yogurt (laban zabadi) is fresh and unflavored; you can sweeten if you wish with honey, jams, preserves, or mint. It rests easy on an upset stomach. is usually made with lamb, or occasionally with beef, onions, potatoes, beans, and peas. To make Egyptian-style kebab, cooks season chunks of lamb in onion, marjoram, and lemon juice and then roast them on a spit over an open fire. Kufta is ground lamb flavored with spices and onions which is rolled into long narrow "meatballs" and roasted like kebab, with which it's often served. Pork is considered unclean by Muslims, but is readily available, as is beef. imported fowl are plump, tender, and tasty. You can order grilled chicken (firaakh mashwi) in a restaurant or buy one already cooked at the street-side rotisseries and fix your own meal. Hamaam (pigeons) are raised throughout Egypt, and when stuffed with seasoned rice and grilled, constitute a national delicacy. They are small, so you will need to order several; the best are usually served in small, local restaurants where you may even have to give the cook a day's notice (a good sign), but beware--hamaam are occasionally served with their heads buried in the stuffing. Option 4 Egyptians serve both freshwater and seagoing fish under the general term of samak. The best fish seem to be near the coasts (ocean variety) or in Aswan, where they are caught from Lake Nasser. As well as the common bass and sole, try gambari (shrimp), calamari (squid), gandofli (scallops), and ti'baan (eel). The latter, a white meat with a delicate salmon flavoring, can be bought on the street already deep-fried. Ruzz (rice) is often varied by cooking it with nuts, onions, vegetables, or small amounts of meat. Bataatis (potatoes) are usually fried but can also be boiled or stuffed. Egyptians stuff green vegetables with mixtures of rice; wara' enab, for example, is made form boiled grape leaves filled with small amounts of spiced rice with or without ground meat. 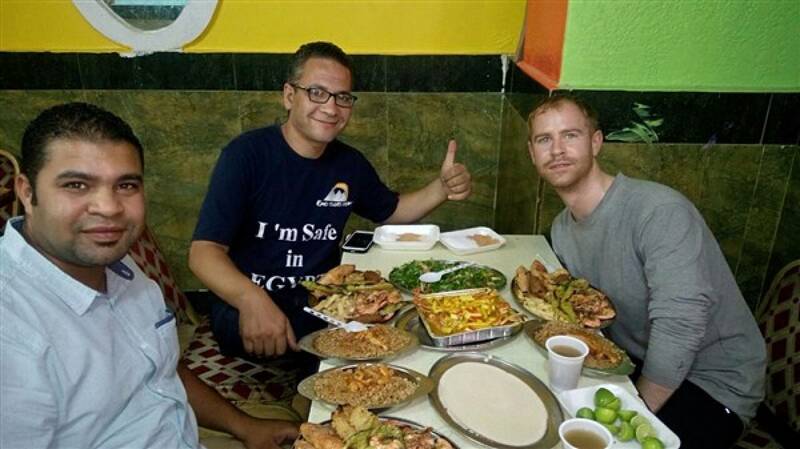 Westerners often know them by the Greek name of dolmadas or dolmas, but beware ordering them by that name; in Egypt, doma refers to a mixture of stuffed vegetables. Native cheese (gibna) comes in two varieties: gibna beida, similar to feta, and gibna rumy, a sharp, hard, pale yellow cheese. These are the ones normally used in salads and sandwiches, but gouda, cheddar, bleu, and other Western types are becoming available. Mish is a spiced, dry cheese made into a paste and served as an hors d'oeuvre. Fruit In Egypt a multitude of fresh fruits are available year-round, but since all are tree- or vine-ripened, only those in season appear in suqs (markets) or on vendors' stands. In the winter, mohz (bananas), balah (dates), and burtu'aan (any of several varieties of oranges) appear. Special treats are burtu'aan bedammoh (pink oranges), whose skin looks like most oranges, but their pulp is red and sweet. The Egyptian summer is blessed with battiikh (melon), khukh (peach), berkuk (plum), and 'anub (grapes). Tin shawki is a cactus fruit that appears in August or September. Goz (nuts) and mohamas (dried seeds) are popular snack foods in Egypt, and vendors can be found selling them nearly anywhere. All are tasty; try bundok (hazelnuts), loz (almonds), or fuzdo (pistachios). If you like peanuts, the ful sudani are especially tasty in Aswan. Egyptian desserts of pastry or puddings are usually drenched in honey syrup. Baklava (filo dough, honey, and nuts) is one of the less sweet; fatir are pancakes stuffed with everything from eggs to apricots; and basbousa, quite sweet, is made of semolina pastry soaked in honey and topped with hazelnuts. Umm ali, a delight named for Mamluk queen, is raisin cake soaked in milk and served hot. Kanafa is a dish of batter "strings" fried on a hot grill and stuffed with nuts, meats, or sweets. Egyptian rice pudding is called mahallabiyya and is served topped with pistachios. French-style pastries are called gatoux. Good chocolate candies are likewise difficult to find, though Western-style candy bars are beginning to make their appearance. The Egyptian ice cream runs closer to ice milk or sherbet than cream. Most restaurants and many homes serve fresh fruits for desserts, and it makes a perfect, light conclusion to most meals. Although Turkish coffee has a reputation for being tart, its actual flavor depends on the mix of beans used in the grind; the larger the percentage of Arabica, the sweeter and more chocolate flavor. Ahwa comes in several versions: ahwa sada is black, ahwa ariha is lightly sweetened with sugar, ahwa mazboot is moderately sweetened, and ahwaziyada is very sweet. You must specify the amount of sugar at the time you order, for it's sweetened in the pot. Most people order mazboot, which cuts the tartness; ahwa is never served with cream. Most hotel and restaurant breakfasts include strong French coffee usually called Nescafe; you may have to specially order it with sugar (bil sukkar) or milk (bil laban). Egyptians adopted the custom of formal afternoon tea from the native Arabians, and it's served with milk, lemon, and sugar on the side. The domestic or Bedouin version of shay is boiled rather than steeped and is often saturated with sugar; this strong tea is served in glasses. A refreshing change from after-dinner coffee is shay bil na'na' or mint tea. ; dried mint is mixed with tea leaves and the mixture is brewed like regular tea . Kakoow bil laban (hot chocolate) is available during the winter, as is Sahlab, a thick liquid that tastes like a cross between Ovaltine and oatmeal. Karkaday, a clear, bright red, native drink especially popular in the south, is made by steeping dried hibiscus flowers, sweetened to taste, and served either hot or cold; the locals claim this delicious drink calms the nerves. Bottled water (mayya ma'daniyya) is available in all areas frequented by tourists; both large and small bottles are sold on the street and from ice buckets at most of the antiquities sites. Be sure the cap is sealed. Mayya shurb or mayya ahday (drinking water) is safe in most metropolitan areas.